Someone at Microsoft must not have gotten the memo. 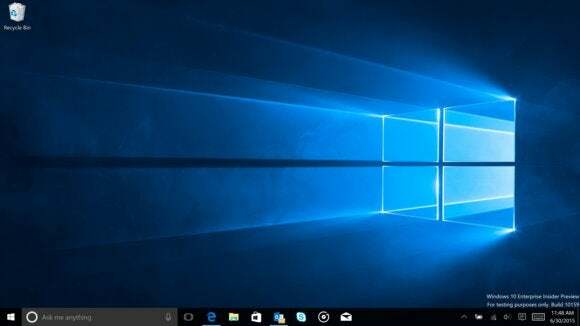 In a statement issued Thursday, Microsoft's top operating system executive repeatedly used the term "update" to describe the first major refresh of Windows 10, which has been tagged within the OS as 1511 to indicate it was released in November (11) of 2015 (15). "Today, we reach our next milestone as the first major update to Windows 10 is now available for PCs and tablets," Terry Myerson, who leads the combined OS-and-device division at Microsoft, wrote in a post to a company blog [emphasis added]. "With this update, there are improvements in all aspects of the platform and experience, including thousands of partners updating their device drivers and applications for great Windows 10 compatibility." All told, Myerson typed the word update 15 times. But used only four upgrades in the post -- and all of those were used to describe moving from an older edition of Windows to version 10, not from Windows 10's original to 1511. So, Microsoft's own guidelines are clear cut, and presumably designed to make it easier for everyone to figure out exactly what the company's doing with Windows 10 as it overhauls a development-and-release model that's served it for four decades. That's especially true in the enterprise, where IT administrators have more scheduling options for upgrades and updates than do consumers, who are locked in to the fastest tempo for both: Immediate. Update, upgrade, tomayto, tomahto? Maybe. But Microsoft's rule-setters say different. "Microsoft will publish two types of Windows 10 releases broadly to the public on an ongoing basis," the company stated in a technical document titled "Windows 10 servicing options for updates and upgrades," the definitive -- and by far the clearest -- description of the nuts and bolts of the "Windows as a service" model that Microsoft's touted from here to Timbuktu and back. First on the short list of two was Feature upgrades "that install the latest new features, experiences, and capabilities on devices that are already running Windows 10." Second: Servicing updates "that focus on the installation of security fixes and other important updates." Updates, on the other hand, are the much more familiar packages that Microsoft delivers on Patch Tuesday, the second Tuesday of each month, and then helter-skelter throughout the month that contain fixes for non-security bugs and code tweaks. Last month, for instance, Microsoft issued an update of some kind on 12 of October's 31 days, with the most important one dumped onto customers Oct. 13. This week, Microsoft delivered both an update -- Tuesday's set of 12 security bulletins -- and an upgrade, the latter in the form of Windows 10 1511. What Myerson described as an update was actually an upgrade by Microsoft's nomenclature, the first for the OS since its July debut, the first also for the Current Branch (CB), the upgrade track assigned to virtually all consumers, many small businesses, and those enterprises that want some PCs on the bleeding edge. Labels are important for Microsoft, for customers, and for the two together. When labels or terms are used consistently, everyone understands what's being discussed. And with Microsoft's scattershot communications strategy -- it's left some Windows 10 customer questions dangling for months -- the more clarity, the better. That's especially true during the stressful transition from a long-used, slow-paced servicing model to one that mimics the sometimes-frenzied agility of mobile. The refresh process is complicated enough without Microsoft making it murkier. That communication is particularly crucial in Windows 10 because Microsoft plans to deliver updates for an upgrade only for a specific stretch of time. For devices assigned to the "Current Branch for Business" (CBB) upgrade track, Windows 10 RTM -- that's the original that rolled out starting July 29 -- will receive updates, like the Patch Tuesday vulnerability fixes, only until the deferral clock runs out. Then users must upgrade to 1511 or lose patch privileges. Under current Microsoft rules -- the company's been vague at times here -- Windows 10 1511 must be in place for CBB devices by no later than November 2016. It's also to Microsoft's benefit to get on the upgrade train for crasser reasons: Upgrade carries more weight, denotes significant changes, signals new versus old, refers to substantial improvements, implies "big" rather than "small." If Microsoft wants to impress customers with the steady state of Windows 10's evolution -- and it does -- it behooves it to swing the label as the bigger stick. An update, on the other hand is lightweight, a tweak, a bug fix, a security patch, a repair on something gone wrong in a previous update. Updates are almost obnoxiously frequent: So far this month, Microsoft's released three for Windows 10. They're the empty calories of servicing. Calling 1511 an update rather than an upgrade is a disservice to the work that went into the refresh and the significance of the changes, both visible and invisible, that landed on customers' PCs and tablets. Argue all you want about 1511's merits and the pace of Windows 10 improvements in stability and quality -- and many are beginning to do that, dismayed by the low number of major changes in 1511 -- but it's not an update. This story, "Windows 10 refresh: It's an upgrade, not an update" was originally published by Computerworld.